Description: Established Hardware Store is a favorite destination for household projects, building products, pet supplies, livestock & pet food. 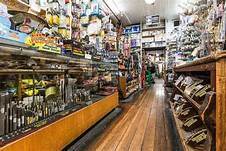 Their staff is friendly and always helpful to customers helping them with DIY projects or finding them someone who can. If they don’t have something they will gladly order it for you. Great location on main Hwy with good street visibility. Includes Real Estate. PRICE IS PLUS INVENTORY! Please call broker for more details on this property and to arrange a showing.